The southern extension of Horace Walpole's house at Strawberry Hill, built "apparently to Lady Waldegrave's own designs" (Cherry and Pevsner 549). The "Waldegrave Wing" of Horace Walpole's Strawberry Hill, Twickenham. This is all part of the Grade I listed building. It was planned by Lady Frances Waldgrave (1821-79), the talented and influential society hostess who had inherited the estate and became absorbed in embellishing and enlarging it in the 1850s and 60s, while married to her aristocratic and demanding third husband (see Reynolds). Inserting a door into Walpole's Round Drawing-Room, she built out southwards from his circular tower, all the way along towards where we now see a chapel (on the far left above; this was put up by what was then St Mary's Training College, after its acquisition of the estate in 1923). St Mary's University College, as it is now known, still occupies the whole of the Waldegrave Wing. Left: Narrow battlemented side block adjoining the older building (now clearly differentiated from it, in white). Right: Detail of the façade on the main elevation. The listing text naturally focuses on Walpole's part of the building, which has now had a massive face-lift, but this wing also demands recognition, particularly since it was rare to have a woman architect, but also because of its own merits. 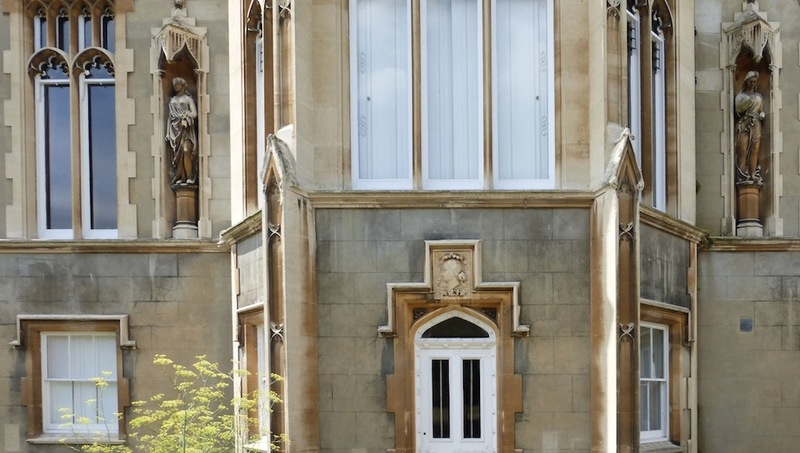 "In an excellent and not at all pedestrian neo-Gothic" (Cherry and Pevsner 459), the extension harmonises well with Walpole's part, and was a considerable achievement, even taking into account Lady Waldegrave's excellent team of helpers: according to information given by J. Mordant Crook in a footnote to Cherry and Pevsner on the same page, her clerk of works was Ritchie, her builder Kelk and her stone-carver Plows. Most probably, then, Ritchie would have been Robert Ritchie of the architectural firm of Brandon & Ritchie, Bloomsbury, who were "known for their Gothic church buildings" (Ashton 233); Kelk would have been John Kelk (1816-86), who would go on to build Alexandra Palace in north London in the next decade, and become a knight of the realm: and Plows, who did the fine carving, would have been the sculptor and architectural stone-carver William Plows (1836-85) of Lambeth. 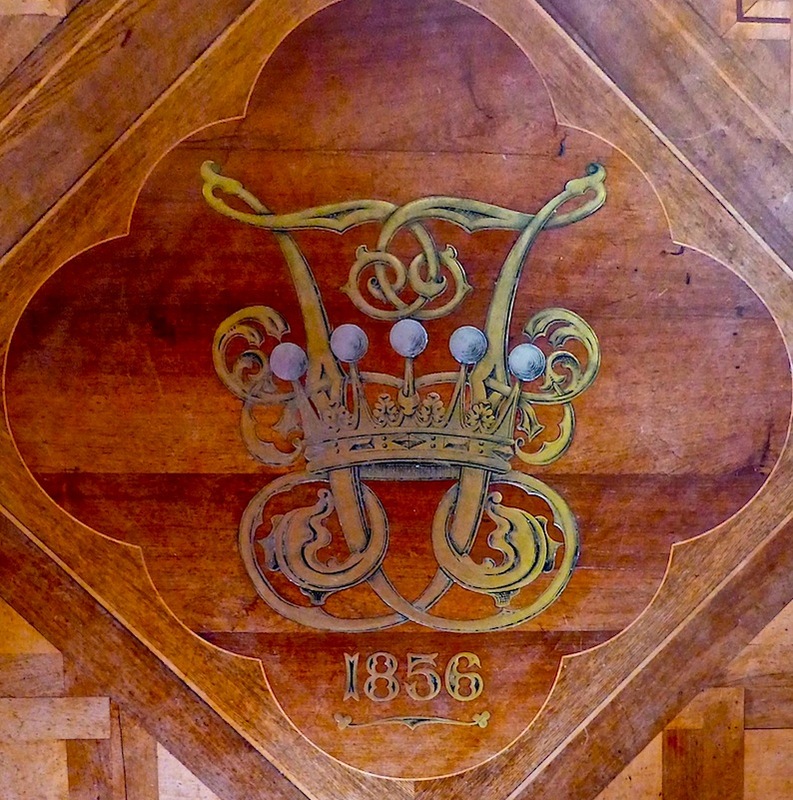 Inlaid brass emblems in Lady Waldegrave's new Gallery floor. Left: A Saracen's head from the Walpole crest. Right: The ducal coronet and scrolling decoration from her own family crest. 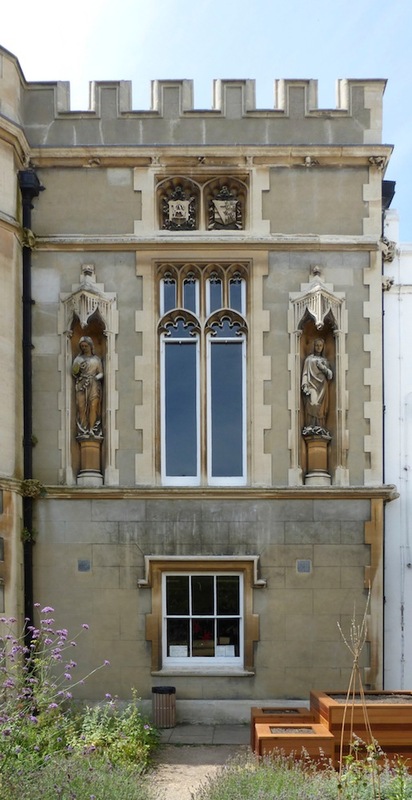 It is worth noting that Lady Waldegrave materially changed the appearance of Walpole's part of the building as well. On the exterior, she altered the roofline by raising the tower at the south west, and added the Tudor chimney-pots. She also changed the approach, making a grander semi-circular carriage-way to the house. As for the interior, she bought up items sold by her second husband, who had inherited Strawberry Hill from his aunt, and hung portraits of her friends in the Gallery, as Walpole had done. More radically, she enlarged the Hall, taking away some of the Gothic gloom that Walpole had intended for it. The time for that kind of effect had passed. 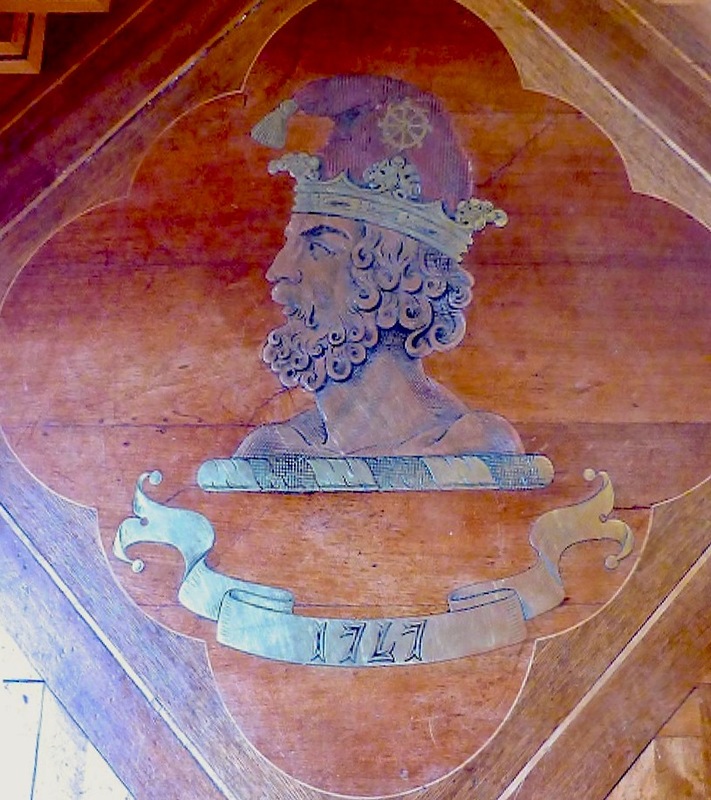 She laid the elegant wooden floor, brought from Vienna, in the Gallery, and set into it heraldic devices from the crests of both Walpole's family and her own. His was dated 1747, the year in which he took possession of the house; hers was dated 1856, the year in which she began her own alterations. It was a nice touch, suggesting her respect for the mind that had conceived the house as she found it, and her own commitment to it. 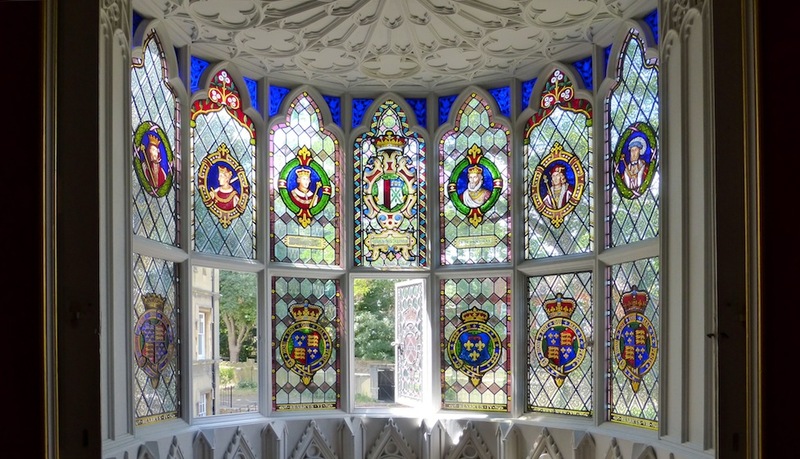 Lady Waldegrave also filled the windows in the Round Room with heraldic glass, as well as inserting the new door to give access to her new apartments. (These apartments included another, larger and more conventionally gracious drawing room, still being used by St Mary's for functions.) Although the general aim of the recent restoration project has been to return the older part of the building to what it was in the 1790s (see "Strawberry Hill: Restoration"), such features are still to be seen there, and are important to its impact. Left: Frances, Countess Waldegrave (taken at Strawberry Hill about 1871). 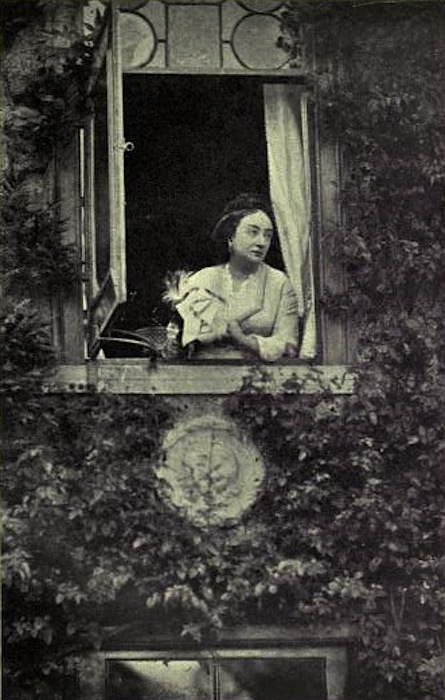 Right: Frances, Countess Waldegrave (from her sitting-room window at Strawberry Hill). Source of both images, and caption material: Lear, facing p.240. The result of Lady Waldegrave's improvements and extension was a palatial house for entertaining on a lavish scale. She was a remarkable character, of Jewish background though (like a London friend, Disraeli) baptised into the Christian church. After being widowed for a third time, in 1863 she married her fourth husband, Chichester Fortescue, who had been devoted to her for well over ten years already. During his political career, he served as a Liberal minister under Palmerston and Gladstone, and the house in Twickenham was a social hub for his fellow-parliamentarians. Indeed, Lady Waldegrave's "social influence had to be taken into account as a factor promoting the cohesion of the Liberal Party" (Reynolds). Among their guests there were Palmerston and Gladstone themselves, the Prince and Princess of Wales, the French princes who were living in exile nearby, and other well-known figures like Edward Lear, who was a close friend of both Frances and Chichester. 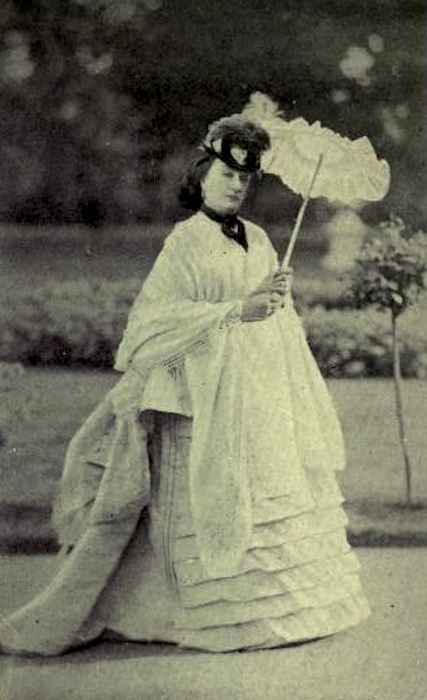 She is thought to have been the model for the millionairess Mrs Max Goesler in Trollope's Palliser novels, who, despite her rather mysterious background and unconventional beauty as well as attire, shines in the social scene because of her acuteness, strength of character, and general charisma. In Violet Effingham's words to Phineas Finn, who ends up marrying her, she "never lets a man go without enchanting him" (Trollope 200). It is sad to read in Lear's letters of Lady Waldegrave's sudden and unexpected death in 1879, and her husband's deep and lasting grief. He finally put Strawberry Hill up for sale in 1888 because it had become intolerable to him without her. It had become, in fact, a "white elephant" (Lear 287). 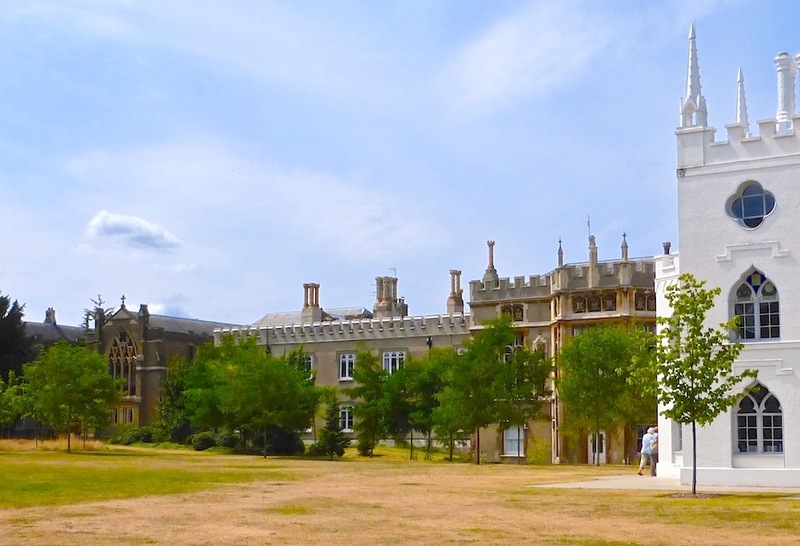 Like so many grand country houses, the vast property eventually proved suitable for educational premises, but unlike many others it is now at least partially (the older part) restored and open to the public. Much more play is made of Walpole's role there than Lady Waldegrave's, but enough of her presence is left to remind us of a brilliant woman whose heyday was largely spent developing the house and putting it firmly on the social — and political — map. Ashton, Rosemary. Victorian Bloomsbury. New Haven & London: Yale University Press, 2012. Cherry, Bridget, and Nikolaus Pevsner. London: South. Buildings of England series. New Haven & London: Yale University Press, 2002. "Historic Strawberry Hill." St Mary's University College. Web. 27 August 2014. "Lady Waldegrave." Strawberry Hill House. Web. 27 August 2014. Lear, Edward. Later Letters of Edward Lear: to Chichester Fortescue (Lord Carlingford), Lady Waldegrave and others. Ed. Lady Strachey. London: T. Fisher Unwin, 1911. Internet Archive. Contributed by the University of California Libraries. Web. 27 August 2014. "Strawberry Hill List Entry." English Heritage. Web. 27 August 2014. 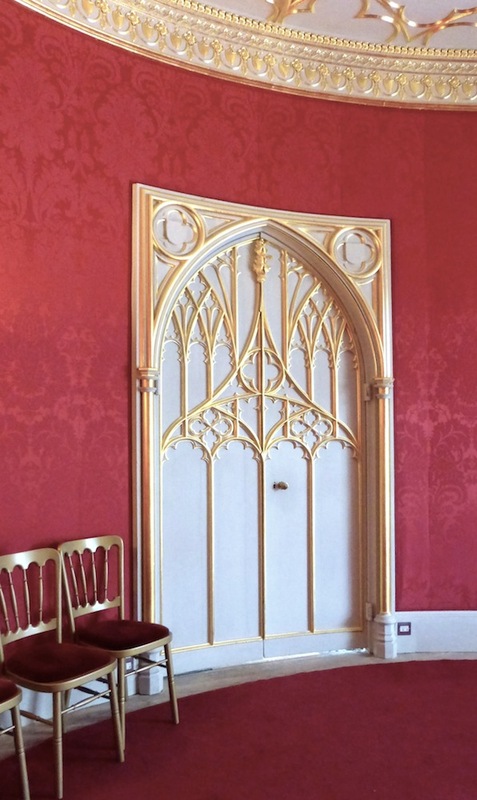 "Strawberry Hill: Restoration." 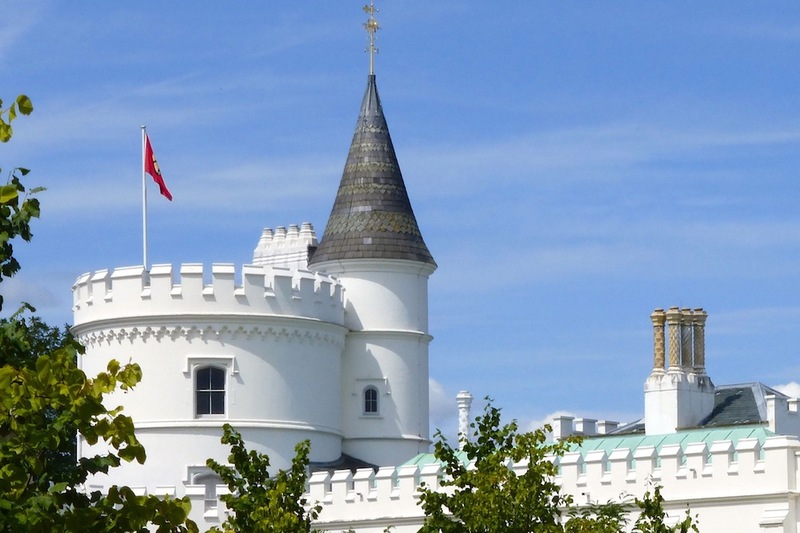 Strawberry Hill House. Web. 27 August 2014. Reynolds, K. D. "Fortescue, Frances Elizabeth Anne Parkinson [née Frances Elizabeth Anne Braham; other married name Frances Elizabeth Anne Waldegrave, Countess Waldegrave] (1821–1879)." Oxford Dictionary of National Biography. Online ed. Web. 27 August 2014. Trollope, Anthony. Phineas Finn, Vol. II. New York: Dodd, Mead & Company, 1912. Internet Archive. Contributed by the New York Public Library. Web. 27 August 2014. "William Plows." Mapping the Practice and Profession of Sculpture in Britain and Ireland 1851-1951. University of Glasgow History of Art and HATII, online database 2011. Web. 27 August 2014.